In this volume, we cover the industrial railways in the South East of England including London. After steam had finished on the main lines, this area still had steam workings at the various industrial sites and for enthusiasts it was the place to visit until the mid 1970s. We start with a visit to London’s Acton Lane Power Station and saddle tanks “Birkenhead” and “Little Barford” in action complete with wasp stripes on their smokeboxes! At Slough Estates complex, Hudswell Clarke tanks are shunting oil wagons. Mind the cars, there’s just a gap! In 1972, we visit Rye House power station near Hoddesdon on the ex-GER main line to see RSH tank No.7597 shunting (more wasp stripes!) before witnessing its transport by road (mind those 25kv wires) for preservation on the Stour Valley Railway. Later, we see it in action on the SVR and on the GCR at Loughborough. Onwards and there are Peckett saddle tanks at Ipswich Sugar factory and at Ford’s Dagenham Works (it had 25 miles of lines), where we see a variety of scenes including the foundry and dockyard. Next to Chatham Dockyard and a 1980s view of the derelict saddle tanks followed by later preservation scenes with restored “Ajax”. 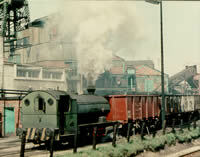 Then to the paper mills at Greenhithe and Gravesend for fireless locos in action in & around the works. 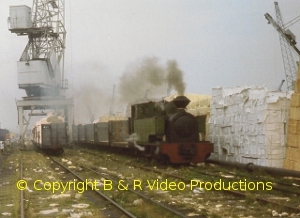 Sittingbourne’s Bowaters Paper Mill had the largest system for paper and we make an extensive visit to it’s narrow gauge railway with mostly pre-preservation views of steam in action on goods as well as passenger trains. Plus views of standard gauge ex-SECR P “Pioneer II”, saddle tank “Jubilee”, the cableway and the dockside. Onto Swanscombe Cement Works & Quarry in 1968 for Hudswell-Clarke tanks busy shunting cement wagons and then to Snodland Cement Works to see “Hornpipe” in action plus steam at Holborough Quarry with “Tumulus”. Finally we visit the Kent Coalfield and the collieries at Snowdown and Betteshanger for extensive steam activity with “J94 type” Hunslets (among others), more wasp stripes, loading & unloading of wagons and a Class 73 electro-diesel at the BR exchange sidings. Cover photo: Colin White”Monarch” at Bowaters in 1969. 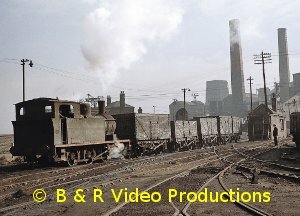 With the plethora of main line and branch line steam film footage from the 1960s, the co-existing but equally fascinating industrial steam scene in Britain is often neglected. It is easy to forget that it continued until around 1980. Although we have featured some scenes of industrial steam in other volumes, our last dedicated volume to Industrial Steam was way back in 1997 with our Volume 52! 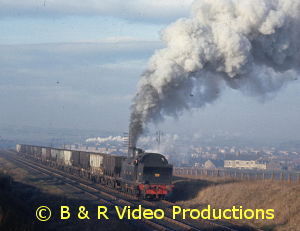 Here we have further look at industrial steam at work in England and Scotland from 1960 to 1980, this time mostly featuring the larger locomotives which worked at collieries and iron stone mines. These locomotives were usually built by private builders, although some ex-BR tank classes were used. The North East and Midland areas are well covered and there are many scenes of long gone engines working in an industrial environment now often vanished. Many of these engines survived into the preservation era and were eventually saved from oblivion. It is only fitting that we conclude our video with 2011 views of a selection of these industrial locomotives at work on preserved lines such as the Tanfield, Foxfield and Blaenavon railways. All the footage is in colour and the film has an extensively researched commentary with an authentic sound track. Keith Pirt/Courtesy Booklaw Publications, A Hawthorn-Leslie tank shunting at Nunnery Colliery, Sheffield, 1956. Some steam lived on in the Welsh Valleys at least ten years after its demise on British Railways. Starting with some Western Region steam in South Wales and a visit to the scrapyards of Cashmores and Woodhams, there follows a number of visits to industrial steam sites, mainly collieries. These are BRYNLLIW, GRAIG MERTHYR, MAESTEG, PARK TREORCHY, WERN TAWR and MOUNTAIN ASH. A visit is also made to the steel works at LLANELLY. The industrial locations ranged from the scenic to typical industrial. Hard working engines are seen, some of them now preserved today, including ex-GWR 7754 and 9642. Cover Photo:- Colin White, 9792 at Maerdy Colliery, 1970. The popular misconception that Industrial railways were just yard shunts with small 0-4-0 tanks or the ubiquitous J94 type will be completely dispelled by this programme. Some systems were enormous like Ashington, Philadelphia and Corby, often fully signalled as well. There were ex BR steam engines to be found from all of the “big four” companies sold into industrial service. There were narrow gauge systems as well at Bowaters, Kettering and in North Wales. Ironstone systems could boast nearly 100 engines. Engines wrestling with poor track abounded at cement works while ports such as Preston, Whitehaven and Falmouth were locations providing steam locomotives at work. Par had one of the smallest and Baddesley Colliery had a Garratt at the other extreme. Fire-less engines found favour with paper manufacturers. The oldest engine in service could be found at Seaham, with Wirksworth a close second. Sentinels lived at Burton Latimer and Whifflett. Crane tanks at Doxford’s and Stanton & Staveley. Even a sewage plant found use for steam. Power stations had side tanks the power of a Black 5, the NCB probably had the biggest fleet of all. These are not posed views of steam but engines working hard for their living in their true environment.There are 100 engines from 25 builders in this story. It was all part of the steam scene in Britain, if you saw them, here are the memories; if not see what you missed.